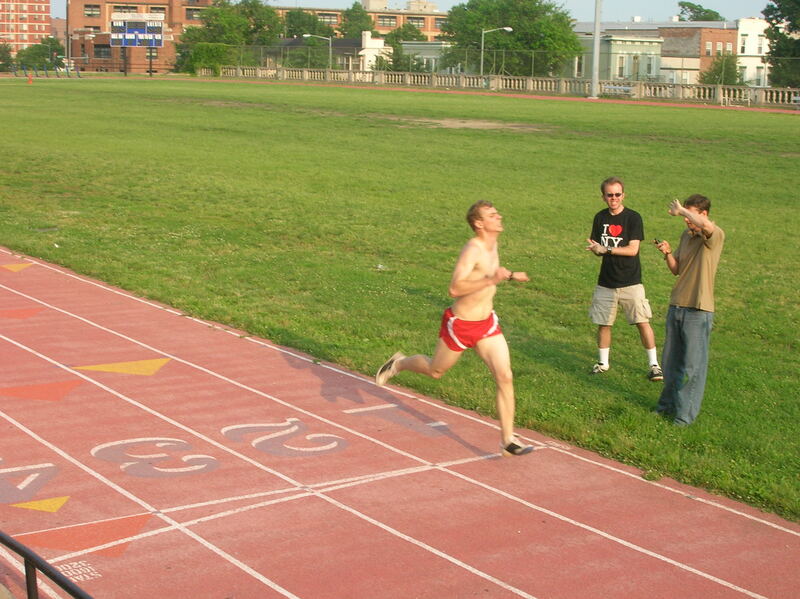 Crossing the line for a sub- 5:00 mile in June 2007 at the historic Cardozo HS track in Washington. I believe all of my adult sub-5 miles (14 of them now) have been done in those red shorts, those zoom loco brand shoes, and no shirt. The yearly thing has been on since I came back on the track seriously in 2006 to train with Skye to run a sub 5:00 mile. Yes, Skye brought me back to the track and coaxed me into ultramarathons both. The mile is not really about pure speed, but compared to running ultras, you have to work to turn those legs over to run a fast mile. This year I definitely went the distance, running four ultras, including two 100 milers. Now it was time to go for speed. And so it goes, on the track. Interval workouts. 800’s. 400’s. 200’s. They all hurt in their own way. But they also make me feel very comfortable, at home almost. I’ve been doing interval workouts and running 5 minute miles on the track since age 14. It’s a good, familiar kind of pain. And 400 meters is always 400 meters. Sometimes 68 seconds is easy. Sometimes 75 seconds is hard. It’s you who is weaker, not some change in the length of the track. Yes, in an interval workout, seconds matter. There are many good places for the Naked Wrist. But the track workout is the one place it doesn’t really belong. It hurts so much that you absolutely consider cutting the workout short. In fact, you know you are doing it correctly when in the middle of one of the later repeats you seriously consider quitting the whole sport. Walking away for good, instead taking up acting or some such hobby. This last level of pain intensity is a rarity. But when it happens, I know I’m finally in good enough shape and working myself hard. Most of these miles in the past years, I’ve been fortunate to train and time trial with other people. Some faster, some slower. This year I have a fairly large training team– the “Econ Runners. ” Maybe around 15 people come out to train with us on and off; today 5 of us came out for the mile. Self-organized, unofficial. But still an important event. Matt and Andy set PRs today, and I was more proud of them than I was for myself. No PR for me, but I turned out another one like clockwork. Only in the last 300 meters did the pain get bad enough for me to dread having to do this every year for the next 9 years. So it went, the speed and the distance, an ultra and a fast mile, within a month. Dec 1, 2011 mile splits 1:14, 2:30, 3:44, 4:57. No pics, but it was probably as haggard as the shot from 2007 above. This entry was posted in Physical Exertion, Pondering, Running. Bookmark the permalink. I believe I was there when you got those shorts 14 years ago and refuse to believe they still fit. But seriously congrats, I’d be happy to get under 6 nowadays.